Crew filling potholes without city permit. INDIANAPOLIS — The city's pothole problem has become so dire and frustrating that some people are taking matters into their own hands. A crew filling potholes on a city road on Friday, without a permit, is now being investigated. A driver who works in the Park Fletcher area reached out to RTV6 about several large potholes. We saw that for ourselves, and noticed crews came out with their equipment minutes later and began filling all of the potholes. The driver RTV6 spoke to says the temporary fixes are not good enough. "I try to avoid this area, but the other roads are just as bad. They are not as bad as these holes are," Kris Hughes, who works in the Park Fletcher area, said. "But if you go down any of the roads around here they were all chuckholes up, patched up, and bumpy and hard. I drive a jeep and luckily I'm OK. But if you have a small car like a Mustang or something you are going to be able to miss them. If you want familiar with this area we were going to bust your rim and bust your tire easily." 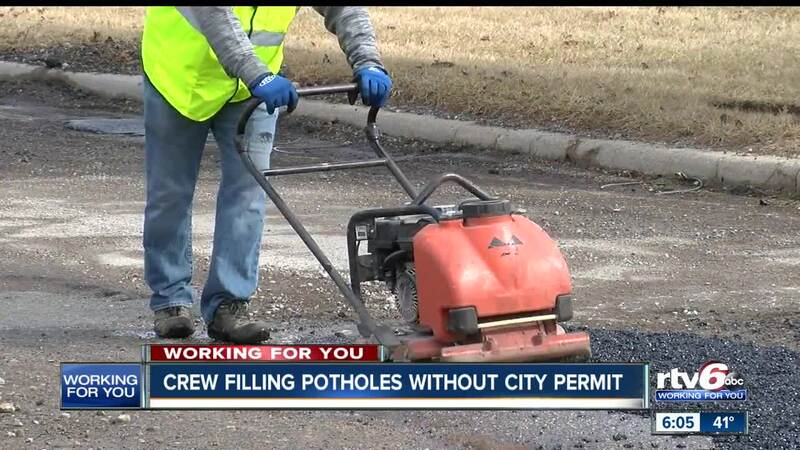 RTV6 reached out to the Indianapolis Department of Public Works and found out Executive Drive is not on the list to be resurfaced as part of 2019 Roadway Capital Improvement Program. The newsroom also learned that the crew out filling potholes along Executive Drive does not have a permit with the city. The Department of Business Neighborhood Services is now investigating and the contractor could receive a violation. Which means work must be stopped and they would need to apply for a permit. A spokesperson for the Department of Business Neighborhood Services says no matter who you are - a private contractor, city contractor or a resident, you need a permit to do work on city streets.